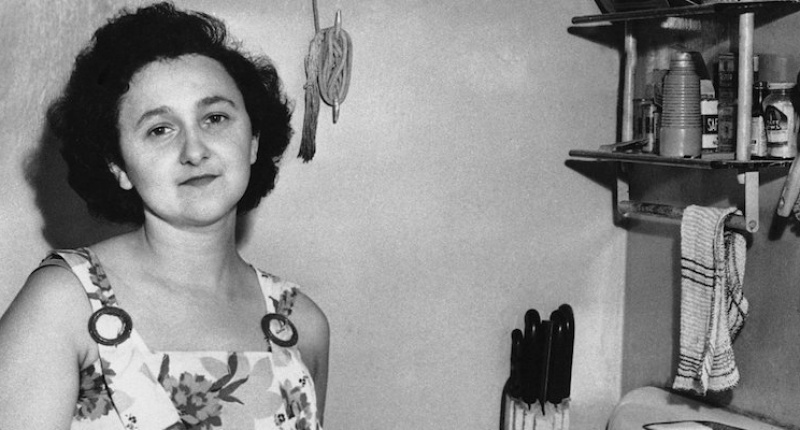 On Monday, the New York City Council declared that the government wrongfully executed Ethel Rosenberg. Manhattan Borough President declared Sep 28th as Ethel Rosenberg Day of Justice in the Borough of Manhattan. At 11:00 am Eastern, on September 28, 2015, in a ceremony on the steps of City Hall, New York City Council Members gathered, with three generations of Ethel Rosenberg's descendants present, to issue a stunning proclamation in Ethel's honor, stating in part, "...the government wrongfully executed Ethel Rosenberg; now therefore BE IT KNOWN: That we, the undersigned Members of the New York City Council, honor the life and memory of Ethel Rosenberg in observance of the 100th anniversary of her birth." See full proclamation by Members of the New York City Council here. "Ethel Rosenberg was wrongfully executed in 1953 which resulted in her two young children becoming orphans," said NYC Council Member Daniel Dromm (D-Jackson Heights, Elmhurst). "Although nothing can erase this terrible loss of life, I am pleased to join my colleagues in the Council in posthumously acknowledging Ms. Rosenberg on the occasion of the 100th anniversary of her birth. It is my hope that this tribute will restore some dignity to the memory of this much-maligned New Yorker and her family." In addition, Gale Brewer, the Manhattan Borough President, bestowed a remarkable honor of her own on Ethel, proclaiming, "...I, Gale A. Brewer, do hereby recognize the injustice suffered by Ethel Rosenberg and her family, and on the occasion of her 100th birthday on Monday, September 28th, 2015, proclaim 'Ethel Rosenberg Day of Justice in the Borough of Manhattan.'" See full proclamation by Borough President Brewer here. "Let me echo Rob's thanks to the members of the City Council, the Manhattan Borough President and the Public Advocate for recognizing the injustice that was done to our mother and, as a result, to her entire family. See full statements of Robert and Michael Meeropol (sons of Ethel and Julius Rosenberg) here. BE IT KNOWN: That we, the undersigned Members of the New York City Council, honor the life and memory of Ethel Rosenberg in observance of the 100th anniversary of her birth. On Monday, September 28th, 2015, at 11:00 am, Members of the New York City Council including Council Member Dromm, will issue a public proclamation on the steps of New York City Hall, honoring Ethel Rosenberg on what would have been her 100th birthday. The public, and members of the media, are invited to attend. Ethel and Julius Rosenberg's sons, Michael and Robert Meeropol (formerly Rosenberg), who were 10 and 6 at the time of their parents' execution, will be present to take part in this historic event, along with other members of the Meeropol family. Michael and Robert Meeropol will speak as part of the ceremony and take questions from the media until the conclusion of the event at 12:00 noon. Ethel Rosenberg was executed along with her husband, Julius Rosenberg, on June 19th, 1953 after being convicted, at the height of the Red Scare-McCarthy period, of giving what was called "the secret of the Atomic Bomb" to the Soviet Union. The recently released grand jury testimony of Ethel Rosenberg's chief accusers, David and Ruth Greenglass, provided powerful proof that Ethel Rosenberg's conviction was based on their perjuries. Ethel and Julius were natives and life-long residents of New York City, where they resided at the time of their arrests. New York City just named a day after a woman who fought for justice - so why did the US government execute her? A woman was honored by New York City Council members and Manhattan Borough President Gail Brewer on Monday, September 28th, on what would have been her 100th birthday. But she didn't make it to 40. She died at the young age of 37, in an electric chair in Sing Sing prison on June 19, 1953, minutes after her husband was electrocuted. Her sons-Robert, 6 and Michael, 10-were now orphans. Her name was Ethel. 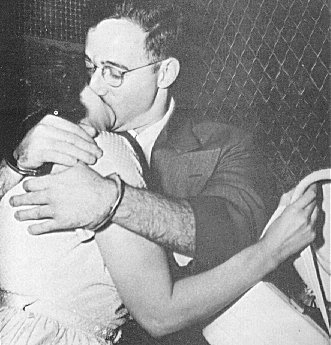 Ethel and her husband, Julius Rosenberg, were the only civilians in American history ever executed for espionage during peacetime and their trial took place during the Cold War at the height of Red Scare hysteria. The case is extremely complicated and controversial, but here are some of the facts that aren't disputed and that are key to understanding the story. In 1950, Klaus Fuchs, a German-born British scientist who worked on developing the atomic bomb was arrested for passing top secret information to the Soviet Union. Fuchs named American Harry Gold as his liaison with the Soviets. Gold in turn, named David Greenglass and his wife, Ruth. And Greenglass named his brother-in-law, Julius Rosenberg, the husband of David's sister Ethel. 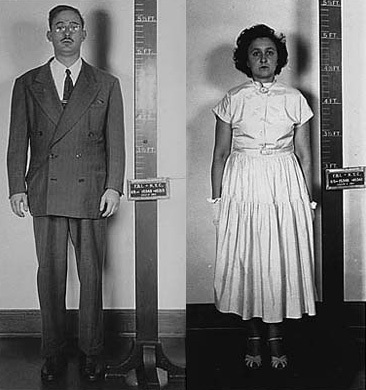 Julius was arrested on June 17, 1950, and Ethel was arrested on August 11. While it appears true that Julius Rosenberg and David Greenglass had been involved in sharing information with the Soviet Union, the U.S. Ally during World War Two, Julius's role was much more minor than the government stated and it certainly did not deserve the death penalty. This isn't just a moral or ethical position, but a legal one. The Rosenbergs were indicted for "conspiracy to commit espionage," which doesn't carry a death sentence. I told them the story and left her [Ethel] out of it, right? But my wife put her in it. So what am I gonna do, call my wife a liar? My wife is my wife. I mean, I don't sleep with my sister, you know. And previously sealed grand jury records, that were only released this summer, corroborate that Greenglass did perjure himself when he implicated his sister. While testifying in front of the Grand Jury, Greenglass said he had no knowledge of Ethel's involvement: "My sister has never spoken to me about this subject," he said at one point. On another occasion he stated, "I never spoke to my sister about this at all." He had also confessed to handing information to Julius on a New York street corner. But right before and during the actual trial, David sang a very different tune. Only ten days before the start of the trial against his brother in-law, David claimed that he handed off the documents in the Rosenbergs' apartment. Then Ruth told FBI agents that "Julius then took the info into the bathroom and read it, and when he came out he told [Ethel] she had to type this info immediately. Ethel then sat down at the typewriter . and proceeded to type the info which David had given to Julius." And that was the version they stuck to during the trial. It was Ethel's alleged typing of notes that got her charged, convicted, and ultimately executed. The only thing that will break this man Rosenberg is the prospect of a death penalty or getting the chair, plus that if we can convict his wife too, and give her a sentence of 25 or 30 years, that combination may serve to make this fellow disgorge and give us the information on these other individuals. I can't guarantee that. But it is about the only thing you can use as a lever on these people. The case is not too strong against Mrs. Rosenberg. But for the purpose of acting as a deterrent, I think it is very important that she be convicted too, and given a stiff sentence. I consider your crime worse than murder.I believe your conduct in putting into the hands of the Russians the A-bomb years before our best scientists predicted Russia would perfect the bomb has already caused, in my opinion, the communist aggression in Korea, with the resultant casualties exceeding 50,000, and who knows but that millions more of innocent people may pay the price of your treason. Kaufman accused the Rosenbergs of atomic spying, even though they hadn't been charged with that. And opined that they were guilty of treason, even though the Soviet Union was an ally, not an enemy, when the Rosenbergs are said to have stolen the atomic secrets. The Rosenberg's lawyers and supporters mobilized through appeals, fundraising, protests and letter writing. And they even got a stay one day before their execution. But it was overturned. And they were executed two years after they were convicted. But their legacy lives on in their sons and even their grandchildren. Robert Meeropol (the brothers were adopted by Abel Meeropol, who wrote the lyrics and the music to Strange Fruit) founded the Rosenberg Fund for Children, which supports children of targeted activists in the U.S. Robert's daughter Jenn is now the executive director of the RFC. And Robert's daughter Rachel defends human, civil and constitutional rights as a lawyer at the Center for Constitutional Rights. Michael co-wrote We Are Your Sons, with Robert and edited the The Rosenberg Letters, a compilation of the correspondence between his imprisoned parents. His daughter Ivy made a documentary about the case, Heir to an Execution, which appeared on Sundance and HBO. And on Monday, on what would have been Ethel's hundredth birthday, the children she had with Julius, and their grandchildren and a great-granddaughter, stood on the steps of City Hall in New York City where Council Members issued a proclamation to which "to honor the life and memory of Ethel Rosenberg," and where Manhattan Borough President, proclaimed the day the "Ethel Rosenberg Day of Justice in the Borough of Manhattan." I spoke to Robert Meeropol about the significance of the event, his memories of his mother, her final letter to her sons (which makes me cry on live radio) and the legacy of his parents on my radio show. The interview starts at 15:00 and ends at 30:00. And here is the segment with Robert Meeropol and an update from the event!